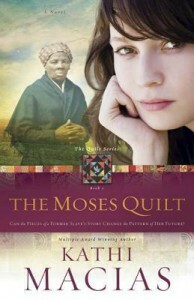 The Moses Quilt is a beautiful story about family, faith, love and history. The characters are wonderfully developed and I adored every single one of them. The love, patience and respect that they had for one another is not just touching, it is something that each one of us would be well served to strive for.Although the main character is Mazie, it is her great-grandmother, Mimi, who steals the show. Mimi tells the history of Harriet Tubman through a quilt, The Moses Quilt. The reader is not aware of the significance of the story in relation to Mazie, but is led to believe that Harriet Tubman's story will some how free Mazie to pursue a life with her love interest.While I was familiar with Harriet Tubman's story, I have never heard it come to life like I did in The Moses Quilt. Not only is this story a wonderful experience for fiction fans, but could quite easily be utilized as a homeschooling tool. The historical facts are accurate and the way that the story is told lends itself to being a unique approach to learning this important piece of history.